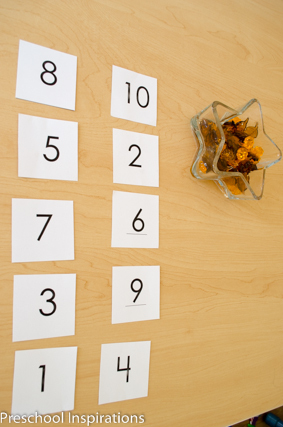 I’m passing along some of our favorite counting and math activities for the fall. As a math lover myself, I try to make the learning process for my preschoolers exciting and inviting. These are all hands-on learning activities that teach math concepts from a concrete perspective, which is what I have found to be the most successful way for young learners to understand about numbers and counting. When I talk about math with people, I can quickly see that it is a subject that they are comfortable with, or it’s a foreign language to them. 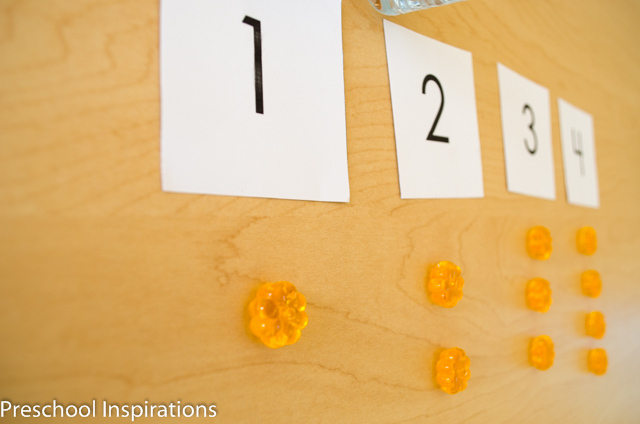 It is my goal for my preschoolers to feel completely confident with numbers and counting. I want them to have the basic foundational math skills to easily transition into elementary school, and I hope what I teach even gives them the math foundation they will need for life. 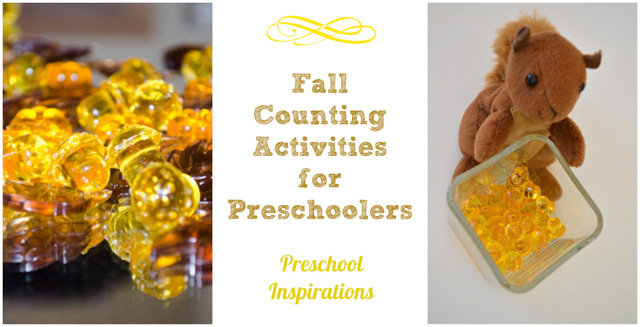 We have some fall gems also known as table scatter with pumpkins, leaves, and acorns that I thought would be absolutely perfect for fall math activities. These were donated by a sweet family last year, and our class treasures these gems! If you are looking for some, I would check places such as Target, craft stores, dollar stores, and Amazon. This post contains affiliate links for your convenience. Here’s one of the beginning activities that we practice. This is a number correspondence activity: the focus is to the show that the number one means one object, that the number two means two objects, and so on. We start slowly and go up to 3, then go higher as I feel that they have really grasped the concept of quantity. Some children pick it up immediately and others take a couple of days. I believe in honoring each child’s pace and above all just helping them feel successful and to enjoy the process of learning. Once they’ve shown competency with the numbers and quantity, I turn it into a game. 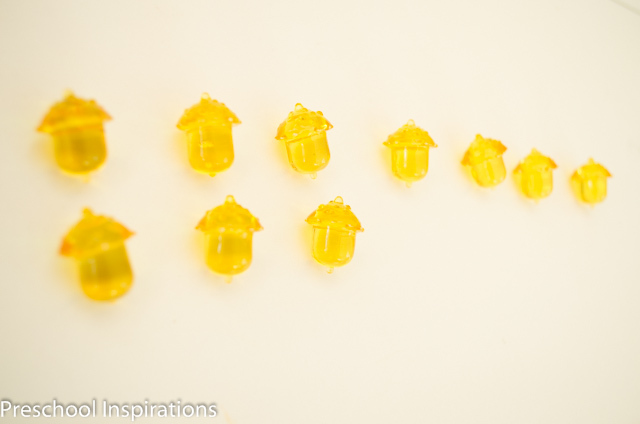 I mix up all the numbers for them to put them in order , a super fun technique I learned from my Montessori mentor. They find number one then count one fall jewel to place below the number. Then we move onto each consequent number. My preschoolers who have counting mastered start challenging themselves by incorporating patterns. Only recently did I just start incorporating storytelling into math, and it’s been a huge hit! I originally saw it being used by a wonderful first grade teacher and decided to adapt the concept for preschoolers. When I brought out these fall gems, I remembered a squirrel that we had around that the class loves. 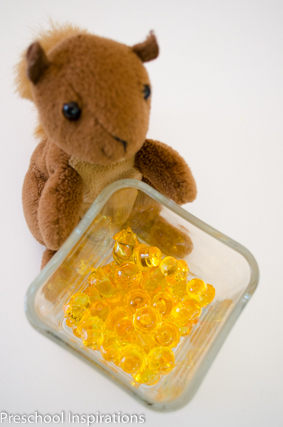 Now, we’re not just talking about numbers, we’re helping Mr. Squirrel find all of his acorns. My story went a little bit like this: Mr. Squirrel is collecting lots of acorns to prepare for winter when there won’t be many around. Let’s help him count how many acorns he has. We don’t want to leave any behind because winter can be long, and Mr. Squirrel needs to be prepared for the cold weather and snow. Along comes his friend who can’t find any acorns. How many would he like to share with his friend? We used the number cards to help sort his acorns, and we even did basic addition while helping him share some acorns with his friends. Storytelling really brings math alive to preschoolers, and every child in my class was completely captivated at the same time. Lastly, I offered some open-ended math practice and play, so we put the gems on a mirror to play with. I saw lots of sorting, patterning, and even more of their own fall stories. My teacher heart was so happy and full to see my class enjoying and applying math skills in a way that captivated them and increased their love for learning. I just saw those same pumpkins and acorns at Target today! I bought the pumpkins, but didn’t get the acorns because I was afraid they would roll. I might have to go back and get them. Great ideas – thanks for sharing! That’s awesome timing, Karen! The acorns definitely roll around a little bit, but my class seems to navigate that really well. I hope you all have a blast with your pumpkins! They are so fun :). I have been using these same kind of pumpkins in my preK room for 4 years. The kids love counting and sorting them. Kristy, it sounds like you have some wonderful activities going on with your class! 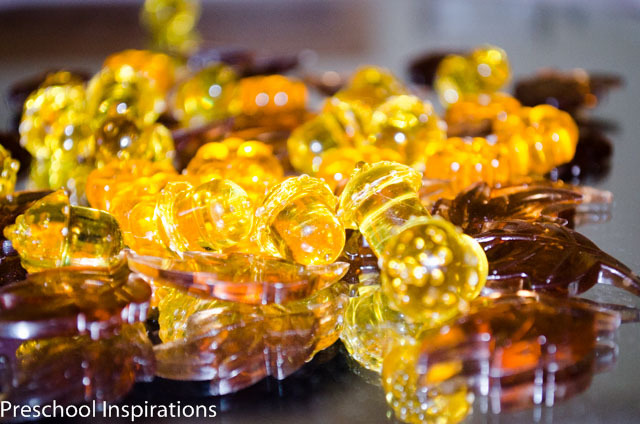 These table scatter acrylics never seem to get old, do they! How much did the acorns and pumpkins cost? I’m trying to decide if I need to make a hour and a half drive. Emmy, that is definitely a long drive! At Target they were in the dollar section. I believe that there are some packages now for $3 with 150 pieces. I would definitely call the store ahead of time and check on it to make sure they’re in stock and the price that works for you. I bought them last year and my children love playing with them. I did many of the same activities as you. I also hid the acorns in my sand table and had them hunt for nuts for the squirrels. 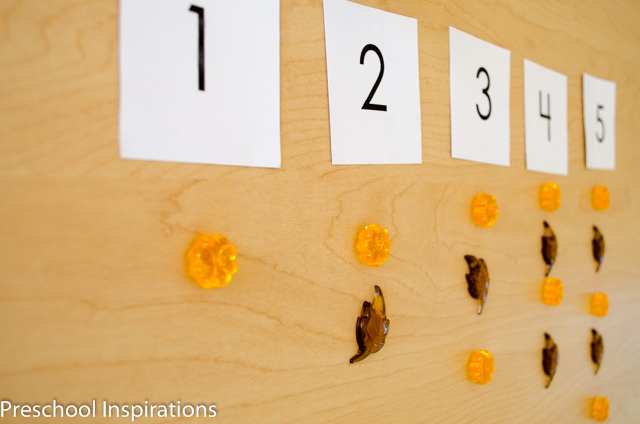 I have number cards with squirrels and a number for them to use with this activity. Your activities sound like a blast, Bette! Thank you for all you do for young children! These activities sound great. I’m wondering how many kids you’re working with at a time. Do you do this with the whole class during circle time or do you break up into small groups. I work with 2 and 3 year olds and I’m trying to figure out how to differentiate for the 3 year olds without the 2 year olds walking away with the materials. Any advice for doing math activities with kids this age? My class is very small, so we have six kiddos. They do this in small groups, but it’s available to them all day. With your class, I would probably introduce it to those that are mature enough to take care of the materials. Table scatter is technically a choking hazard to children under three, so I would make sure that the two year olds are closely supervised (and probably some of the threes will need to be too). If they’re not ready for the number association part, this would be great on a mirror, a light table, or even to have in home living. I hope you all have a blast!